Isn't preparing food in a clean oven a pleasure? Absolutelly, it is! But who really is pleased with the prospect of cleaning the oven at home? It is going to be tough to find volunteers from the house. And, it's just one of those chores we just leave aside for another time that never arrives. To further aggravate the matters is the expectation of needing to inhale the disagreeable and often poisonous sprays used. And our oven never really becomes as clean and shiny as the one on the picture. 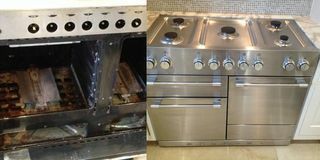 Hiring professional oven cleaning in East London is the perfect solution to get rid of all unwanted carbonation that has built up inside your cooker. Our professional oven cleaners are well instructed how to use the newest machines and techniques to secure the best results for you. All our employees are fully insured so you can sit back and relax while we work hard for you. Our comprehensively taught workers recommend regular cleaning of your oven at least once in six months in order to maintain your appliance in excellent working condition. Entrust us to do the work you have been postponing for some time. Our cleaner will be finished before you know it. We are professional cleaners and our work is a quality work. We, at Prolux Oven Cleaners take pride of our reputation for excellent cleaning results and complete customer service and satisfaction. We use only non-toxic, fume free, eco-friendly and safe cleaning products in your home. He/she is going to check the work and is going to leave your kitchen in its prior condition. We, Prolux Oven Cleaning are located in East London and service London and its immediate suburbs. We work with the most efficient cleaning products available. Our cleansing agents are entirely harmless for your home and your household. They are non-toxic, non-caustic, fume and odor free. We. Prolux Oven Cleaning, take pride of our reputation as the highest quality oven cleaning company in East London. In addition - just take a quick glance at our price calculator and see for yourself our fantastic prices!. What is more, we offer large savings when you schedule several cleaning services with us for one visit.